What’s in a microphone? That’s a tricky one. From the staggering value of the Blue Yeti to the eternal quest for anywhere approaching decent accuracy from a wireless setup, everyone’s needs are different. Some people are happy to sit at a desk; others crave the freedom of using a transcription device to dictate anywhere. Budget plays a part, of course, but you can’t put a price on accuracy – after all, the more words Dragon gets right first time, the more time you save proofreading and editing. For freelancers on a deadline, time is money; even if you don’t measure your productivity in dollars per hour, your time is equally precious. I’ve always had the opinion that dictation is an investment in your writing business. It’s a costly experiment for those unsure whether they can easily transition from typing to talking; you need a decent computer, a copy of Dragon itself and – the final piece of the jigsaw – an excellent microphone. SpeechWare have once again come up with the goods in the latter department with two very different microphones that aren’t cheap but deliver superb accuracy. First up is the FlexyMike Single Ear Cardioid (SEC). As headsets go, this is as thin and light as it gets. Weighing in at just 5g/2oz, it really is barely there once you manoeuvre it into place. I’m not a huge fan of wearing headsets, but even I didn’t have a problem with this one – it’s about as comfortable a device of this type can possibly be. When you first unpack the FlexyMike, you might feel your heart skip a beat at what €149 buys you – but what initially appears flimsy is actually made of a very strong metal alloy (more on this below). SpeechWare cite a number of improvements in this version of the FlexyMike over their previous model. Firstly, they claim the unidirectional microphone element is more sensitive than ever before; secondly, that there are significant improvements to the actual construction. This includes a titanium “memory frame” with three points of contact in the earlobe, all contributing to high comfort and impressive stability despite the feather-light feel. The price reflects the insanely light weight and miniaturisation, the likes of which I haven’t really seen in a headset before. You are also paying for a stunning level of accuracy. For me, this is primarily a transcription microphone; plugged into a Sony recorder at 192kBps MP3, it produced flawless audio that hovered between 99.3% and 100% accuracy, depending on the complexity and length of the source material. 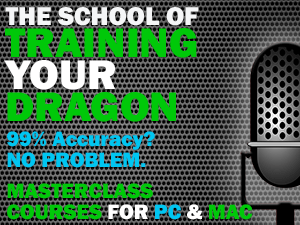 This was in Dragon Professional Individual 15; it also produced 99.5% accuracy via straight dictation in version 6 for Mac when paired with a SpeechWare USB MultiAdapter (an additional purchase at €149). When using a setup like this, you are getting into eye-wateringly expensive territory; it’s almost €300 for both the FlexyMike and SpeechWare’s own USB soundcard to go with it. Bear in mind, though, this gives you a complete solution for both desktop dictation and mobile transcription (although, disappointingly, you will need an additional adapter to plug the FlexyMike into a smartphone). But that’s not all. SpeechWare also sent me their latest TwistMike, a quirky device unlike any other I’ve seen. It is, in essence, a giant gooseneck with a big old clamp on the end of it – utterly bizarre at first glance but, when positioned on a desk, it starts to make sense as a genuine alternative to a large studio mic on a boom arm. The gooseneck is so flexible that it can be positioned at almost any height or angle and the included 2m cable (78.5in) should enable you to set this up pretty much however and wherever you want it. The downside? Again, it’s expensive (€179 – ouch) and, while it will plug into a recorder via its 3.5mm jack, this surely isn’t the expected use scenario (although the 30in/75cm long boom can be worn around the neck as long as you don’t mind people openly pointing and laughing at you). Instead, it is ideally paired with a TableMike base (if you already own one) to make it the “longest desktop microphone in the market” with the added bonus of a mini-XLR connector. Alternatively, it combines superbly with the aforementioned SpeechWare USB MultiAdapter, which the company claims is acoustically matched for maximum performance. This pairing provides the same audio signal as their award-winning TableMike desktop microphones (as they share the same capsule and electronics), but in a much smaller and transportable format. It’s hard to argue with this latter combo as, again, my testing resulted in consistently high accuracy of over 99.5% (and again, in some cases, 100%) in both dictation and transcription across the PC and Mac versions of Dragon (transcribed files were slightly less accurate on the Mac, but that is a shortcoming of this version of the software and would result in the same issue with any microphone). I have to admit to being slightly nonplussed at the look and design of the TwistMike when I first took it out of the box but, after clamping it to my desk and fully appreciating its flexibility, I was won over. Suddenly, my Rode NT-USB (a microphone I love, by the way) seemed almost intrusive and clunky on its huge boom arm. Even more surprising was how I found the TwistMike to be even more versatile, allowing me to position and angle the microphone in any way I pleased. It’s certainly different, that’s for sure, and delivers on accuracy without any question. The same goes for the diminutive FlexyMike SEC – packed with a carrying case and some windshields (although a couple of miniature deadcats would probably be a good addition), this could well be the ultimate portable microphone for the transcription aficionado. That FlexyMike SEC intrigues me. I make good use of handheld Olympus voice recorders but I have been looking for a headset microphone that would allow me to use a Sony PCM M10 in a belt case (it is just a little large for extended use as a handheld) . But I wonder about wind noise. While deadcats work very well on handhelds I think that having a clump of frizzy hair next to my mouth would draw more than a little bit of attention. Did you have a chance to test ambient noise rejection? 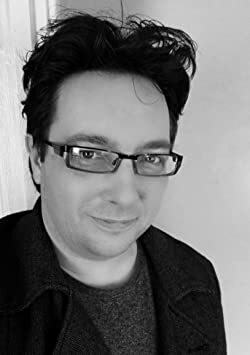 Thanks Scott, I am also working my way through your Masterclass for mac course which I bought to get me running on the mac, and also bought the Flexymic because it was recommended. The Flexymike DEC that I bought does come with the 3.5mm 2 into one jack that says it is for Android phones. So I now have Dragon, your course, the mic and ready to go but now seems I need something else. I was wanting to be able to use that same mic for the phone and also my macbook pro as I travel a lot with it. I can connect the mic and a headset into that 3.5mm jack and it inputs into the macbook pro through the headphone jack on the computer. My question is: Can I use the 3.5mm 2 into 1 jack from Speechware for the macbook pro, input through the headphone jack on the computer? Or do I need the 3.5mm jack for phone and also the USB converter to use on the macbook pro?. By the way I’m finding the course very useful. Hi Patrick, glad you are finding the course useful. I think there is a little confusion in the product description of the FlexyMike – the jack is not compatible with any modern Android phones (or iPhones, MacBook Pros and so on for that matter). It is only compatible with voice recorders and PCs (such as desktop computers) which have separate analog audio inputs. You will need a USB adapter for your MacBook Pro as the laptop has a 3.5 mm “combi” socket. This is not compatible with the separate 3.5 mm jacks found on most analogue headsets. I’m really confused. None of the descriptions online for the DEC mention including the 2-in-1 adapter needed for Android phones. Is it included with them all, but just not mentioned? You’re right, doesn’t look like it’s included any more. Knowbrainer are selling it in a ‘TabletMike’ bundle. I’m confused because none of the online descriptions of the SEC mention the 2-to-1 adapter needed for my Android phone’s headset jack. Is one included with each SEC even though it’s not mentioned in the descriptions? Good question – I will try it out in some windy weather over the next few days and report back, Rick. After reading your advice I bought a flexi mic dual ear cardiod, with the wire headset. It came with a traditional jack and an adaptor with two traditional jack inputs and one output, not a USB. Is this ok for my macbook pro or do I need a USB adaptor? Your MacBook Pro will use a ‘combi’ jack that integrates both headset and mic in one 3.5mm slot. This isn’t the same as the jack on the end of your FlexyMike so you will need a USB adapter (see the photo above of Speechware’s own USB MultiAdapter) that acts as an external sound card. Andrea Electronics also make a USB adapter that is well received. Our user “Marta” is right with her laconic hint or comment Rick: maybe the FlexyMike DEC, which you can see in the video being tested nearby Niagara Falls is better against wind noise! This may be of interest for other potential Canadian customers. After reading Scott’s review of the FlexyMike, seeing the quick response of SpeechWare to questions raised here, and researching the company’s online reputation (impressive) I decided to buy. The quick answer to this tale is that the official Canadian distributor is in Toronto (vocalinks.com) and they have the 2nd generation in stock at $189Can (~150US). Although it was not reflected on their webpage this morning I received confirmation directly from the president of the firm within minutes that they do have it in stock. But it wasn’t easy getting that far. The Amazon.ca page does not mention the cheaper and presumably faster Canadian source and instead list SpeechWare as the seller at a higher cost. Third party sources on Amazon.com didn’t want to ship to Canada. I did find speechrecsolutions.com who would ship but they were upfront in saying that because of the shipping costs I should look around for somebody closer to home. Thanks for the info, Rick! What a sheer pleasure having customers like you all over the world! I’ve read your book and found it very helpful. Helpful enough to prompt me to buy your course. So there is no need to buy the MultiAdapter if you use this only as a transcription mic? I have a Sony ICD-UX560 that I’d love to use with this if it works that well. My main use case would be transcription of recordings made while walking outside. Also, you mention that you need an adapter when using the FlexyMike SEC with a smartphone, does it come with a lightning adapter necessary for the newer iPhones that lack a headphone jack? David – yes, that accuracy was with the FlexyMike SEC plugged straight into a Sony voice recorder. No MultiAdapter needed for pure transcription. There is nothing Lightning-based out there right now but you could use something like this and simply plug it into the Lightning to 3.5mm adapter Apple includes with iPhones 7/8/X. There is also a version of this made by Belkin that should work (and allows charging at the same time). I can also confirm excellent accuracy using the SEC straight into a Sony PCM M10 recorder and terrific noise/wind rejection just using the supplied foam windsocks. Those windsocks are devilish hard to get on because the hole is quite small and it takes some manipulation to get them on. I’ve been using the Flexy daily for long transcription for the last week and I am very impressed. You are a Pro and it is a real pleasure to have demanding customers always striving for the best like you! … by the way, we forgot to mention, note that the elegant FlexyMike case is a little bit oversized on purpose, since the microphone is so tiny, just to fit inside most digital recorders and/or USB adapters! Hi Scott, glad I stumbled upon your site! I was wondering, what kind of accuracy % can you get with the Blue Yeti and is the extra money for the Tablemike worth it? You also mentioned a “new 2018 Tablemike One” at the end of the post. Is this a new and improved version of the product? I can’t seem to find any info about it. Finally, if you had to choose between the Flexymike SEC and the Tablemike, which one would you pick? Hi Ethan. The Blue Yeti is an excellent mic – outrageously good value. I believe pretty much any good quality mic, with proper profile training, can hit around 98% accuracy. I’ve seen the SpeechWare products introduce that final extra 0.5-1.5% accuracy increase. It’s really about marginal gains – if you are someone churning out hundreds of thousands of words a year, 1 less mistake in every 100 adds up. For everyone else, it depends on whether the cost justifies the improvement. They also offer the long-distance (green mode) dictation functionality and the ability to use accessibility devices such as foot pedals which may or may not be of interest. The TableMike One is a stripped-down version of the TableMike – no release date as yet. This may not be on the market for a while and will likely hit Europe first. I cannot pick between the FlexyMike and TableMike as they are completely different products with varying usage cases. The TableMike is ideal for desktop dictation use but not such a good option for travel and of no use for transcription. The FlexyMike is ideal for voice recorders/transcription but also requires a USB adapter for computer use such as, for instance, the SpeechWare USB MultiAdapter (if you do not have a standard 3.5 mm mic-in connector available; I would often going for USB, though, due to the poor quality of many built-in PC soundcards). Which one you choose is really dependant on how you will use it. Thanks again Scott, really appreciate your in depth response! Thank you, Scott, for offering your audience your book, this website, and this review. I wish you well in all aspects of life. I’m following up on something that you and others briefly touched on. To be precise, I’m using the FlexyMike DEC, which you’ve also reviewed. I’m curious about your following comment from this post, and about something it suggested to me. This got me researching. I like to hike and dictate hands-free with my digital recorder by using my FlexyMike DEC. Too often, though, wind noise has interfered to the point that I’ve either stopped dictating, or given up to continue dictating, indoors. If one of these furry windscreens would fit my FlexyMike DEC and reduce such noise, I would be overjoyed! Could you recommend a miniature deadcat likely to fit the FlexyMike DEC? Even if you can’t recommend one, if you can offer some tips for finding one that balances fit and effectiveness, I would be grateful. I just received the Movo ones, today… did you mean the 8 mm ones? I don’t see how I can stretch one over the FlexyMike DEC. Would you recommend a larger Movo? The other sizes are 10 mm and 12 mm. I am trying to use the FlexyMic single ear mic. I’m having a big problem using with my voice recorder and android phone. When I use the mic with the recorder (which isn’t the greatest, i admit) as either an mp3 or wav, and 2have Dragon transcribe the files the results are horrible. Gibberish. When I dictate directly into the recorder without the mic, it’s fine. Same thing with the phone. I see something about an adapter for the android and recorder, but I don’t see anything in the case that could be it. I have an extension cord, some wind baffles, and a clip. Am I missing something? Hi Amy. What type of recorder do you have? Bear in mind on certain brands (particularly Sony) you need to specify in the menu options that you are using an external headset. Many people are caught out by this as the recorder continues to capture your voice through its internal microphone. 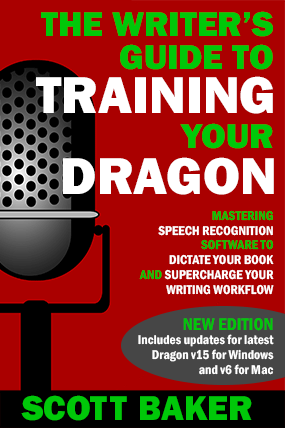 You also need to set certain settings for best results with dictation – these are listed in the transcription part of “The Writer’s Guide to Training Your Dragon”. I don’t think the adapter is sold with this microphone – it may be an additional purchase. It might be worth contacting SpeechWare at info@speechware.be to find out more.